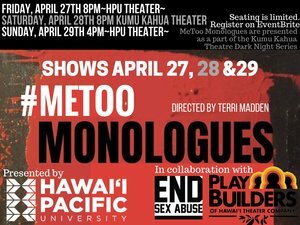 Theater Company at Hawaii Pacific University, Kaneohe, and Kumu Kahua Theater on April 27-29th. The response was outstanding and trended locally on social media. As important as the show, was the question and answer session which followed after every performance. There was always a social worker on hand to help answer questions, and each session lasted about an hour. One audience member stated, "This to me is church. This is what church should be like." In preparation of the #MeToo Monologues, stories of sexual assault survival were collected by Maisa Thayer, a graduate student with the HPU School of Social Work, via social media, flyers, and as well as connecting with students through her sphere of influence. When the director, who was originally selected to help shape the play, had to drop out for personal reasons, Theyer reached out to PlayBuilders for help and Terri Madden volunteered to step in. 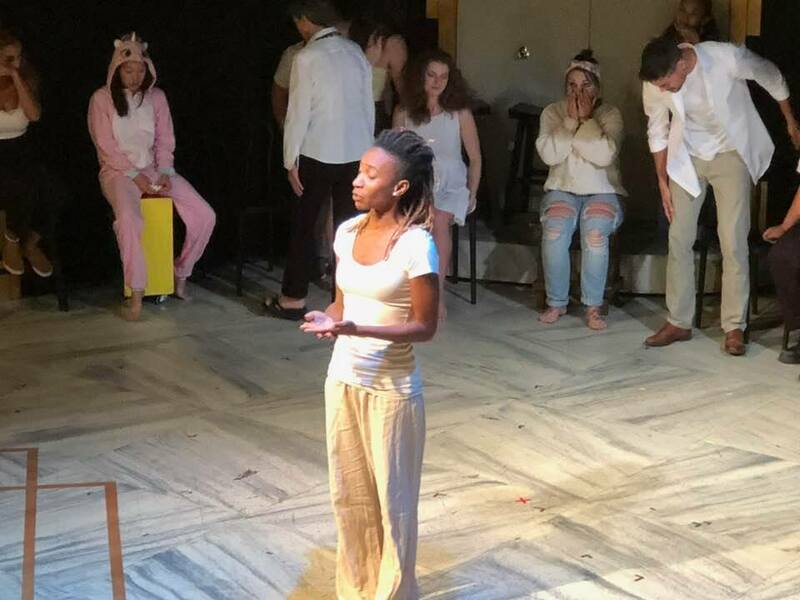 What resulted through our combined efforts is an excellent example of an interdisciplinary approach to solving difficult social issues, combining social work and theater. Destiny Sharion, also a social work student at HPU, put it best: "You have the Macro, Mezzo, and Micro aspects of social work. Macro level of social work is interventions provided on a large scale that affect entire communities and systems of care. Mezzo social work happens on an intermediate scale, involving neighborhoods, institutions or other smaller groups. Micro social work is the most common practice, and happens directly with an individual client or family." Sharion explained that individuals who submitted their stories were operating on a micro level. They had to know themselves, and had to work at a pretty deep level to get their ideas on paper. 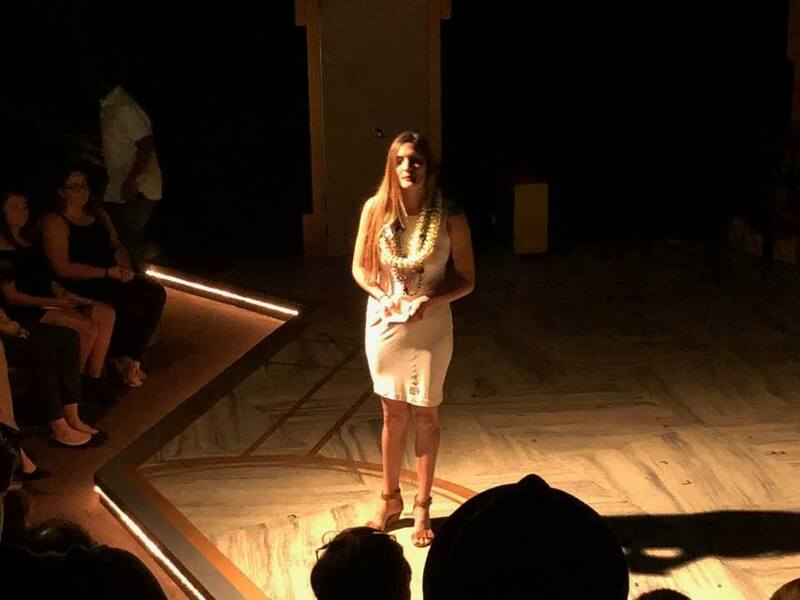 Those who shared the stories- whether they were telling their own stories or the stories of others, were operating on mezzo level- sharing information and stories with the community of Hawaii Pacific University, as well as the broader theater-going community. HPU and PlayBuilders were also working on this level by producing and directing the play so it could be presented to the community. Now the audience... a very important part of the project- they listened as part of the mezzo level, however they (and we), armed with information in hand, have the opportunity to affect change on the Macro level- to affect change in government and society at large, by deciding to participate in making changes that will benefit men (yes there are those who have suffered as well), women, and children who are survivors of sexual harassment and assault. But perhaps the most powerful aspect of this play- is itʻs power to prevent abuse from happening in the first place, by simply telling the stories. Yes. Stories are powerful medicine.